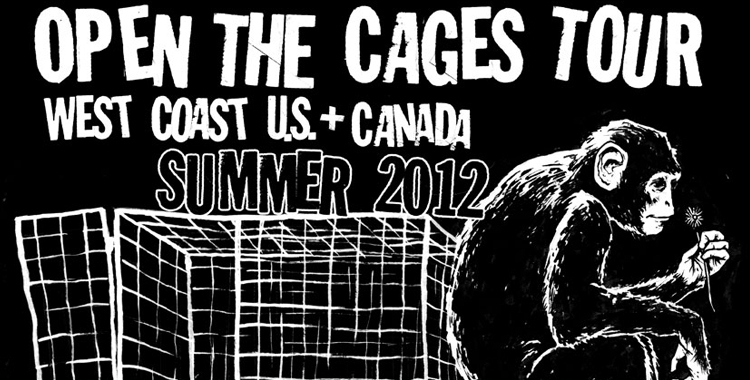 Open The Cages Tour is a West Coast traveling conference focusing on Animal Liberation. The Tour will be making stops from San Diego, CA (July 12th) all the way up to Vancouver, B.C. (Aug 3rd and 4th) with a bunch of stops in between, many featuring two days of events. Each of the cities along the tour are home to animal research laboratories,which is the focal point of the tour. There will be speakers, artists, and performances by punk/folk musician, Mike VXV. Maximum Tolerated Dose, from Decipher Films is a new documentary about the intertwined lives of the Animals and the People in the Labs will premier on the tour. Take a look at the trailer above. Matt Gauck (same guy who made our new stickers) designed this tour T-Shirt. Its Pre-Sale, so getting one now will really help the tour.